I was excited my travel plans to Death Valley coincided with the rains moving in. It rained pretty hard at Death Valley the day before I arrived. It also drizzled on my way into Death Valley, but it let up just when I arrived. Bad weather makes photos more interesting because it puts clouds in the sky. But, the clouds only hung around for a day and a half. One of my goals was to get a panorama shot of Zabriskie Point. I got two and having the clouds really helped. See the photos below. 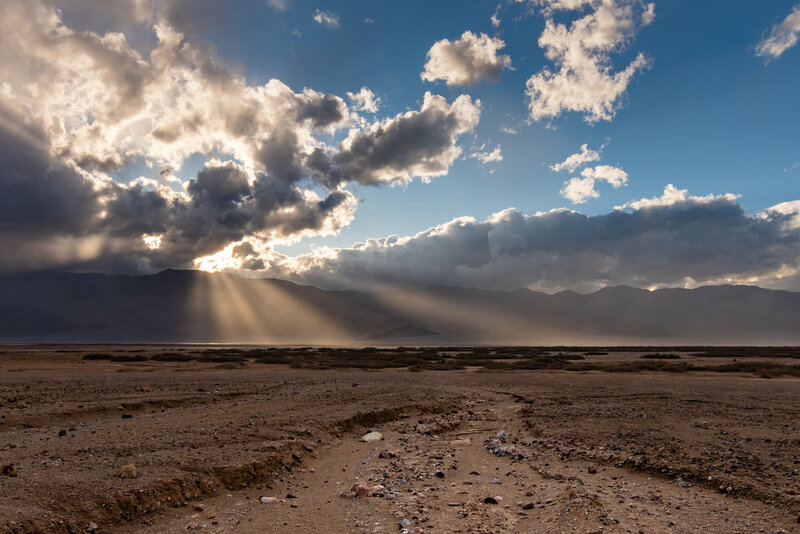 Stovepipe Wells is the first visitor area when approaching Death Valley from the west. It just stopped raining and the clouds lit up the peaks in the distance. I hiked about a mile in to capture these hikers admiring the storm clouds. I was looking the other way trying to get a grand view down the valley. I was happy that I looked this way. After this, the wind picked up enough to knock my tripod over. It was a good thing my camera wasn't still on it. I arrived a day eariler while it was raining heavily. Death Valley can have flash floods and the rangers will not take tours into the box canyons if there is a hint of rain. This image is not a box canyon, but it looks freshly carved. This is the shot I came to get. I wanted to get the entire scene. I also wanted to have clouds in the sky. It's a very different scene without the clouds. This is four combined shots with the very widest angle lens I have. 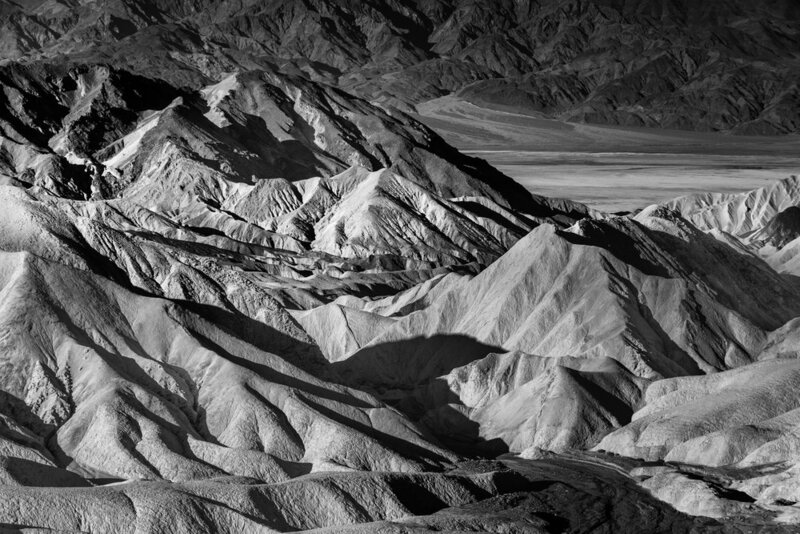 Zabriskie Point has a great view of big dry wash called, "Gower Gulch." It goes all the way down to the valley floor. I hope to hike into it one day. I wanted to hike through Gower Gulch. I had to park at Golden Canyon and hike to the Gower Gulch entrance. I didn't make it it. It was getting late and the wind started howling and it didn't feel safe. That didn't stop me from taking this selfie on the way back. I like the curving peaks of Gower Gulch. This is not the best photo, but i will get an awesome shot one of these days.